If you do a simple search engine query for “how much time does it take to purchase a home?” it will be corrected to “how long does it take to purchase a home.” For the working medical professional, it is well understood that there is a significant difference between how long it takes to do something over weeks and months and how much time out of your day that tasks take. 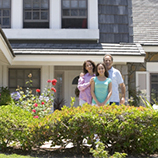 While it may be perfectly acceptable that it takes the average buyer approximately four months to buy a home — 45 shopping days, about two months to close, and another week or so until move in — it is not acceptable that this process may require tours, meetings, and filing of paperwork that takes a few hours each day. Medical professionals work long, busy shifts, where there is little time to scarf down a snack or use the restroom. Taking the time to complete the steps to purchase a home means either sacrificing time that is spent caring for patients or time with family. In the medical field, time is a precious commodity that cannot be squandered or taken lightly. That is where Houses For Healers comes in! We understand the sacrifice you make to take the time away from your own family to care for your patients. So, we want to help you maximize your personal time, by doing the time consuming home-buying tasks for you! Follow along as we show you how we help you keep your time while you purchase a house in the DC or Virginia area. On average, families looking to purchase a home will spend 30 to 60 days shopping for the perfect home. This part of the process tends to be the most time-consuming. First, you will have to spend time searching for available homes that meet your needs. Then, you’ll have to contact the seller’s real estate agent to make an appointment to view the home. To save time, some people dedicate full days to plan several viewings or attend open houses. At Houses for Healers, you can simply let us know what you want from your new home and property. We will clarify every detail — floor plans, required rooms, location, land size, and any other special details. We will then do the shopping for you. 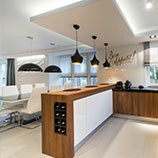 We will go to viewings and open houses until we narrow down the shopping list to a few homes that meet your desires. This means that you will only need to spend a few hours — rather than days — looking at prospective homes. 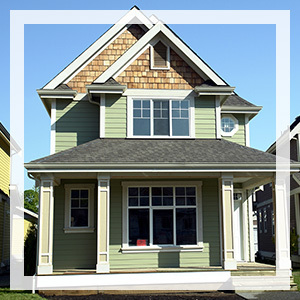 Once you decide on the home you love, we will initiate contracts. Once you find the perfect home, the next step is to enter into a contract and begin the lending process. If you’ve already been pre-approved and have a significant down payment, and the house passes inspections, this step may be quickened slightly. The good news is, the contract to closing phase doesn’t take nearly as much day-to-day time to take care of but can require you to take some time out of your day randomly to submit or edit required documents. At Houses for Healers, we will negotiate contracts and handle the paperwork for you. This saves you not only time but also stress by reducing the hassle of collecting all the information and submitting it to the correct entities. We will also ensure that all of the inspections are done and repairs are made as they should be. Moving from your old home to a new one can take a lot of time. Not only do you have to pack up your old home, then you have to coordinate movement to the new home and then unpack and settle in. This can be especially time-consuming if your home is large or if you are moving to a different city or state. At Houses for Healers, we can use our resources to help you pack, move, and then unpack and set up your new home. Not only does this help you to save time, but also helps you relax while you are home with your family and focus while you are at work healing. Chances are, if you are looking to purchase a new home, you are also looking to sell your old home. In addition to all of the steps and time it takes to find and buy a new home, you’ll have to devote a similar amount of time to sell your home. 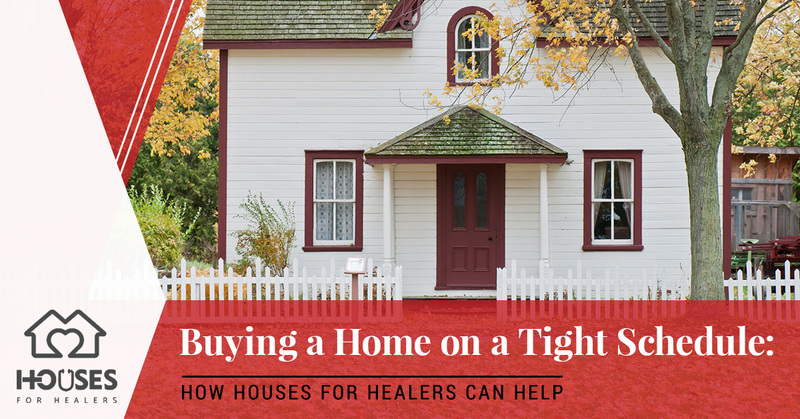 Tune in to part two of this blog, where we will discuss the time it takes to sell your home and how Houses for Healers can help. Tailored specifically for healthcare providers, our real estate company bundles a wide range of comprehensive services to make the home buying and selling process effortless for you. Our goal is to deliver successful real estate results while saving our clients time, money, and stress. After all, you devote your life to healing others, our goal is to give you what you deserve! You don’t have to sacrifice time or money to purchase a new home; let us do the legwork for you. Visit us online to find out how it all works and then contact us to get started! A one-stop shop of real estate and home-related services, including discounts, refunds, and lowered rates, we are certain our team can deliver success, and save you time, money and stress. Combining industry and market knowledge, with the latest technologies, services, and incentives, we make the home buying experience more successful and much simpler. Using advanced and numerous marketing strategies, our goal is to sell your home at its maximum value, in the least amount of time, with little to no heavy lifting on your end. Moving onto a new home or leaving your old one behind should be the least of your worries. Whether you are buying or selling your home - let us help!